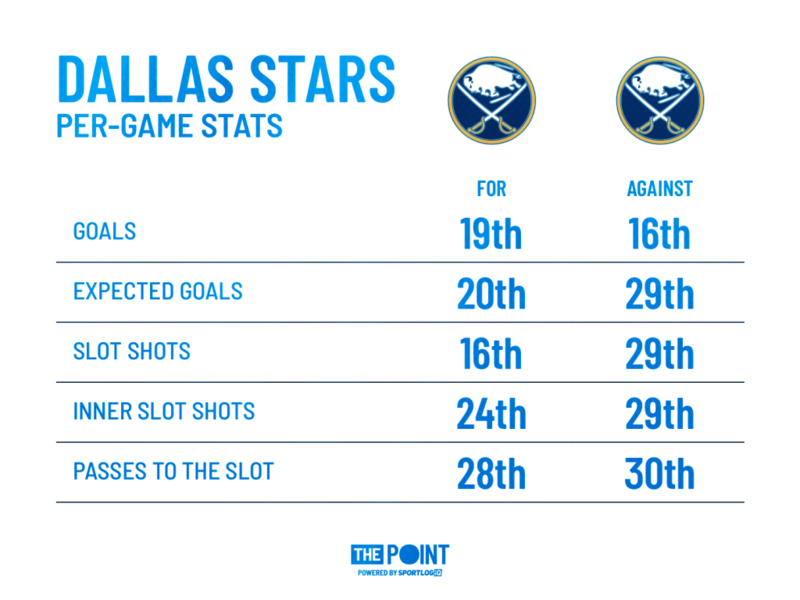 Point Shot - Sabres vs Stars: A Battle of Top-Heavy, Fringe Playoff Teams - The Point Data-driven hockey storytelling that gets right to the point. Tonight’s Buffalo-Dallas game will feature a pair of teams fighting for their playoff lives. Buffalo is currently only a couple of points away from the last Wild Card spot in the Eastern Conference, while Dallas is tied with two other teams in points, but have games in hand on both teams so they’re holding on to the last Western Wild Card spot by a hair. The Stars are a low-event team. They have one of the league’s stingiest defenses, but their one-dimensional, pop-gun offense can’t take advantage of their exemplary defense often enough. Despite the league’s 3rd-best defense, they post a disappointing -2 goal differential, a testament to how top-heavy their offense is. 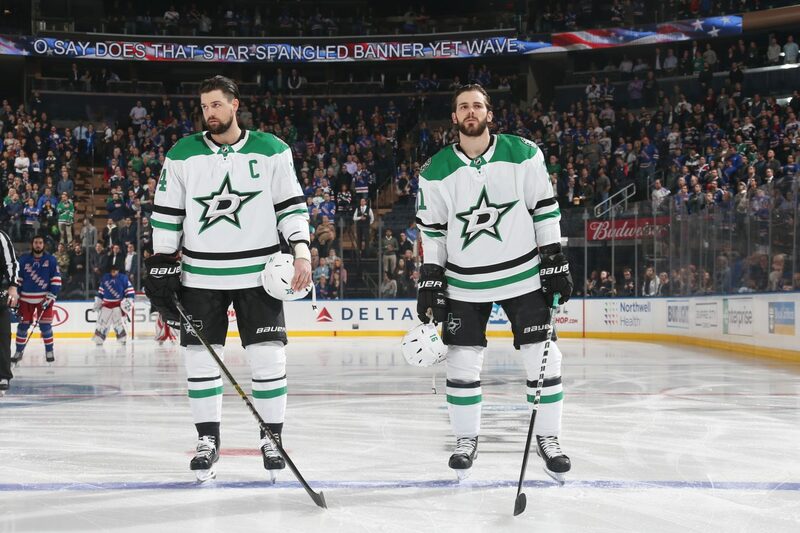 Outside of their big three of Jaime Benn, Tyler Seguin, and Alex Radulov, no player had topped the ten-goal mark. Jason Spezza is the only other forward to score at least 20 points (he has 21). Opposite them tonight is another top-heavy team, the Buffalo Sabres. 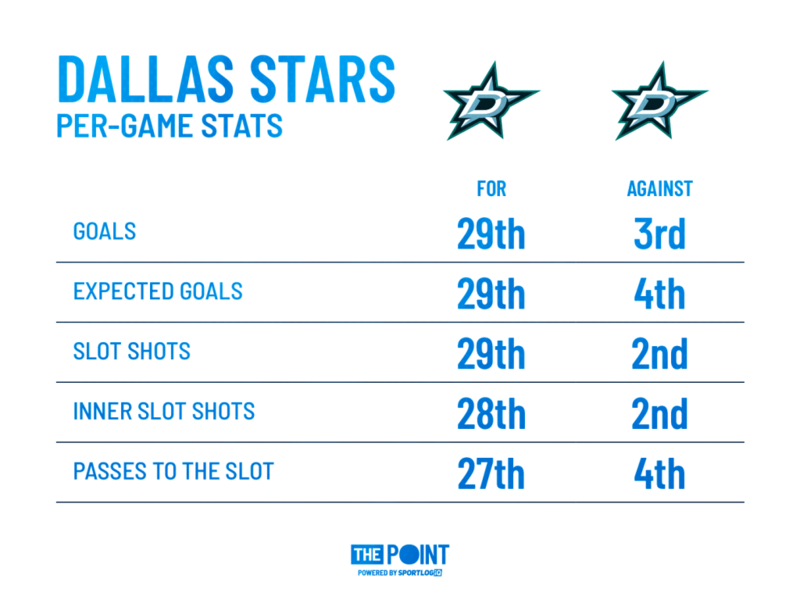 Buffalo’s defense isn’t nearly as stingy as Dallas’, but the offense is equally one-dimensional. Defensively, Buffalo’s middle-of-the-pack ranking in goals against is misleading. Their defense performs like a bottom-five unit, but they’re bailed out by stellar goaltending. As a duo, Carter Hutton and Linus Ullmark have combined for a -0.4 expected to actual goals against mark, 5th best in the league. This means they save one extra goal every two and a half games compared to league-average goaltending. They’ve kept the Sabres close all year and helped them win games they probably shouldn’t have. On the other end, Buffalo’s Big Three of Jack Eichel, Sam Reinhart, and Jeff Skinner has been tearing it up this year. Skinner is second to Alex Ovechkin with 31 goals, Reinhart is just five points away from tying his career-best 50 from last year, and Eichel is scoring over a point per game for the first time in his career. Behind them, however, it’s the same story as Dallas, a total lack of depth. Jason Pominville is their only other double-digit goal scorer with just 10 goals. Connor Sheary joins Pominville as the only two forwards to top 20 points, with 21 and 20 respectively. Two top-heavy offenses, one of them going up against one of the league’s best defense and the other trying to crack some of the year’s hottest goaltending. This game doesn’t project as a high scoring game, unless both Big Threes come out firing. But when the dust settles, one team will leave with two crucial points in bank for their playoff push.